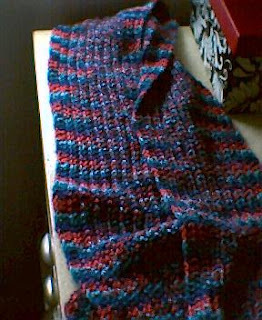 Last night, as I was looking through my yarn stash for something, I ran across this scarf I made a long time ago. I don't have the yarn info any more, but I know it's hand-dyed sock yarn. I used a lacy rib pattern that I found in one of those Barbara Walker stitch books. Anyway, I looked at it and thought, "That would be a great gift for my brother's girlfriend!" And since I'm going to see them this weekend, the timing is perfect as well, so I threw it in my bag. Then it occurred to me that it'll look pretty shabby for me to give a gift to my nephew and his mom but nothing to my own brother. 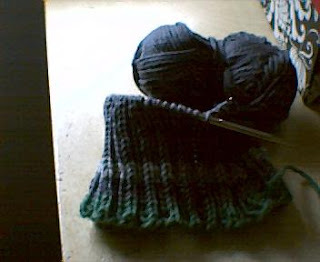 So I continued digging in the stash and found some a lovely gray yarn and cast on for a hat. We'll see whether I can finish it on the plane this afternoon. Eeep! ooops!! i'm sure you can get it finished on the plane. you did great with your holiday planning and knitting. Hey, Lynette. I did it! I finished it on the plane, and my brother loved it. He's losing his hair, so he needs something to keep his head warm anyway.